New & Old Retroviral Mugs Restocked! Hello everyone! Good news! Our online shops are finally restocked and ready for you! All 6 Retroviral mug designs are available on Folksy and Etsy. The last few months have been very busy post-Kickstarter. Back in May we received our biggest order of mugs to date, and we have been packing orders steadily since then. All of our Kickstarter pledges are on track to be dispatched by the end of this month, so we thought it was high time to reopen the online shops! You can order mugs via Etsy or Folksy, whichever is most convenient for you. Thank you for all of your orders and support so far. Please keep spreading the word… like a virus! Did you know that 5 pence from every Retroviral mug sale is donated towards research at The London School of Hygiene and Tropical Medicine (aka the LSHTM)? The LSHTM is a world leader in developing vaccines and treatments, with the mission of improving global health. It is wonderful to be contributing towards this mission. The director of LSHTM, Peter Piot, was a key figure in responding to the recent Ebola Virus crisis, and so it was a natural fit for our charity donations to be given to the school; our Retroviral mugs are covered in images of viruses, so it makes sense for them to be linked to an institution which is battling the effects of these diseases. Until yesterday, I had never visited the LSHTM campus! I was kindly invited to visit the school grounds, meet the team, and hear more about the school’s work and (super-interesting) history. LSHTM is housed in a beautiful 1920s building in London’s Bloomsbury. It has many of the original Art Deco features (including a droolworthy library), plus lots of Science-inspired artwork and historical artefacts (for example, John Snow’s replica pump handle… and no, not that John Snow). Interesting fact: The original LSHTM campus was located near London’s Docklands, because sailors returning from far-flung locations would bring back unfamiliar illnesses – hence “Tropical Medicine” – that needed urgent attention! The corridors of the new campus have curved, wooden elements which are reminiscent of the hulls of ships, or ocean waves. A nice detail. Thanks for having me, LSHTM! To donate to LSHTM directly, click here. To order Retroviral Mugs, click here. Retroviral is a collection of Fine Bone China mugs for design nerds and science geeks alike. The eyecatching designs riff off unexpected biological motifs: the microscopic structure of virus particles. The collection includes six designs: Measles, Influenza, Smallpox, Rabies, Herpes and HIV. Retroviral is an artist’s spin on scientific information, and exists at the meeting point between design and science communication. Retroviral is live on Kickstarter until April 3rd. The more pledges we receive, the more mugs we will be able to make… and the more we can then donate to the London School of Hygiene and Tropical Medicine. If you miss the Kickstarter deadline, fear not! The mugs will be available for online pre-order on Etsy and Folksy. Thank you! New Retroviral Mugs… on Kickstarter now! We’ve got three NEW Retroviral mugs! We’ve launched them on Kickstarter! Our Kickstarter campaign is live NOW! See it HERE! We’ve been working with a new manufacturer to perfect six mug designs, three new (see GIFs below): Influenza, Measles, Smallpox, and three old: Herpes, HIV, Rabies. Now it’s time to get them manufactured and into our customers’ homes. On Kickstarter, backers can pre-order the mugs before we get them manufactured, thus covering production costs in advance. If you want to complete or expand your collection then please jump in! You’ve got until April 3rd to get involved in the campaign. The more you pledge, the more mugs you get. The more pledges we get, the more mugs we can make! It doesn’t stop when we reach the funding goal! Check back here for updates on the Retroviral relaunch. Thank you very much for your support so far! Hello! We’ve just restocked the Thefty online shop in time for some Christmas shopping! We’ve got the full range of Retroviral Mugs available, as well as Christmas Cards and art prints. Happy shopping! Hello! 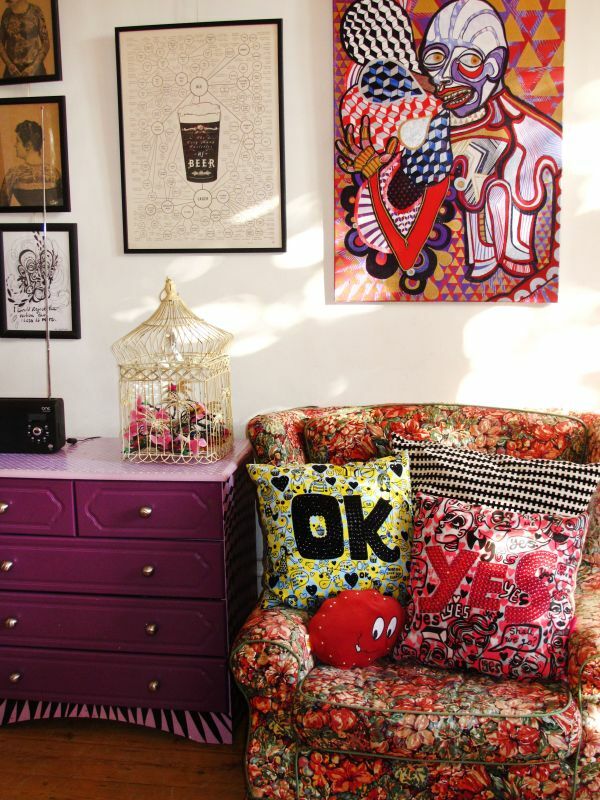 The Ohh Deer Pillow Fight competition has been extended, so you can now get your Retroviral Cushions until December 1st! 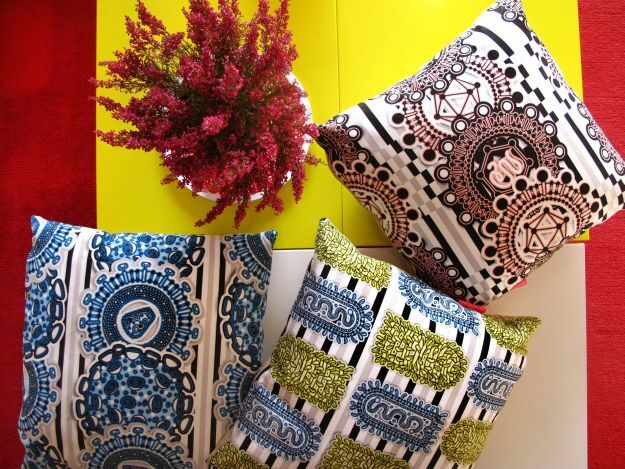 I ordered one of each design for myself – Herpes, HIV, Rabies, and a collage – and can confirm that the colours are lovely and bright, and the cushions are nice and fluffy. 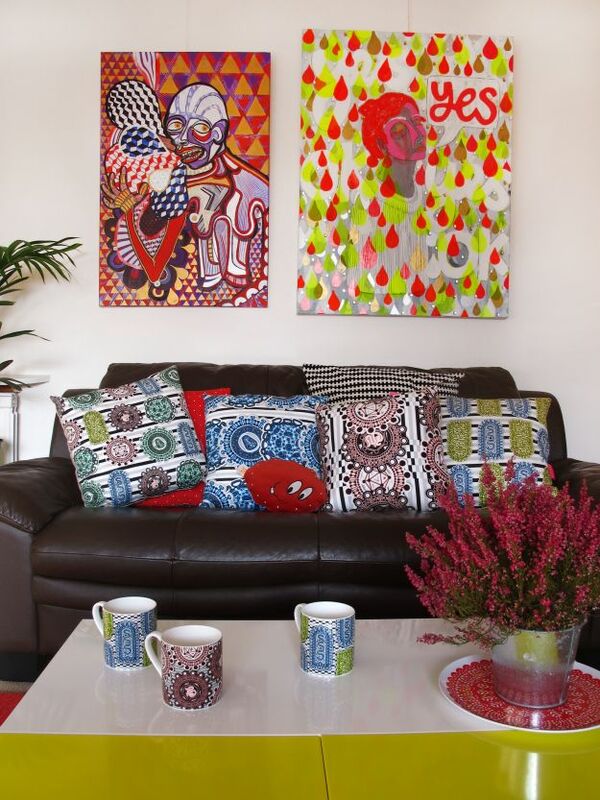 Of course, in addition to cushions, Retroviral mugs are still in stock in our online shop. Exciting news! 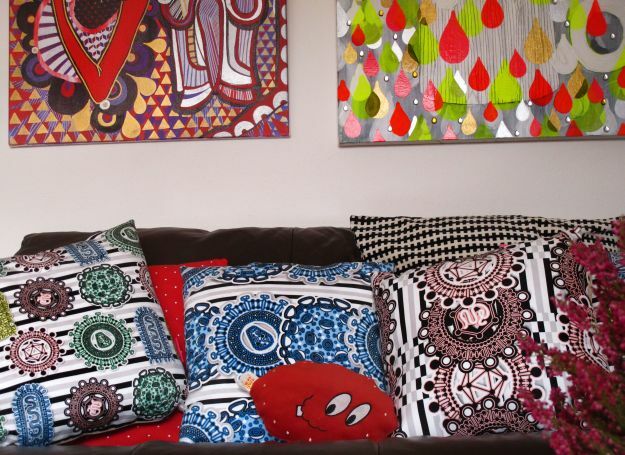 Thefty is part of the Ohh Deer Pillow Fight, meaning that you can now order Retroviral Cushions in four designs: HIV, Herpes, Rabies, and a multi-virus mix. The cushions will only be available until November 15th, so get your Christmas shopping in early! Pillow Fight is an annual competition run by Ohh Deer to find new contributors. Hilariously, the winning designs are those that go the ‘most viral’. HA! If you’d like to support Thefty, then please help Retroviral go viral on Facebook, Twitter and Pinterest (tagging Thefty and Ohh Deer where possible). 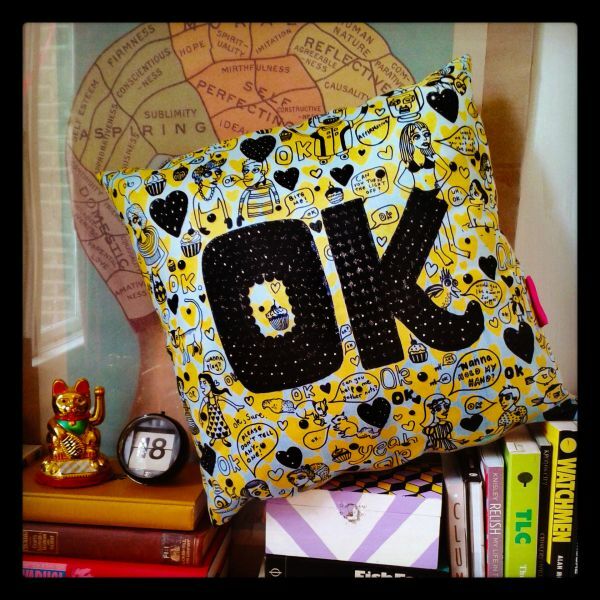 Of course, you can also buy a cushion (or four!) – there are great multi-buy discounts available on Ohh Deer. DETAILS: The cushion covers are made from super soft faux suede with a fully-illustrated front and a stone-coloured reverse side, as well as a zip fastening. They measure 43x43cm, and contain a 50x50cm insert to keep them plump. (You can opt to receive the cushion without the insert.) They’re machine washable at 30c and are hand made in the UK. Matching mugs are available from the Thefty online shop. To learn more about the Retroviral collection, click here. RETROVIRAL: We Have Lift Off! All right, no more teasing! The website has been updated, the new collection is live, and the shop is open! Come on in and dig around! I’d love to hear what you think. Thefty Gets Real: Here we go…! Hello! Hey guys! I’m back! Thank you for sticking with this blog despite months of silence. I disappeared to work on a mysterious personal project which I told you nothing about…until now (cue the Drama Button). You might have noticed the redesign of this website, and there are plenty more new things to come. Thefty started out as a nickname, and it has become my art alter ego, but I’ve always envisioned Thefty as something else. See, I love stuff. Patterned, OTT, boldly-illustrated, over-saturated stuff. Slightly off-beat, put-it-on-your-shelf-and-grin-at-it, buy-it-gleefully-as-a-gift stuff. Beyond creating illustrations and paintings, stuff – specifically, homewares – is what I’ve dreamed of making. To me, Thefty has always been the name of my design label that never was. Which brings us to today: I am currently staring at a huge pile of boxes filled with the very first batch of true-blue, real-deal, for-serious Thefty homewares. Yes! They’re fresh from the manufacturers and I’m so excited! It has taken literally years to get here, and I can’t wait to show you what I’ve been making. HINT: Science geeks will not be disappointed. Are you ready for this? Because I really, really am. Stay tuned! p.s. Don’t you worry – this blog will still feature lots of art and illustration and photography. Christmas Cards Thefty Style: Robots, Cupcakes & Dinosaurs! Guys! My Christmas cards are back in stock! The cards are bright and festive , but they’re also totally non-denominational (i.e. there is not an angel or a nativity scene in sight). They can be purchased individually (with hand-embellished rhinestones) or in packs of 6 (2 designs per pack). There are 4 designs to choose from: Dinosaur Santa, Festive Froggy, Gingerbread Robots, and Christmas Cupcakes. Click to purchase your Christmas cards from my online shop. 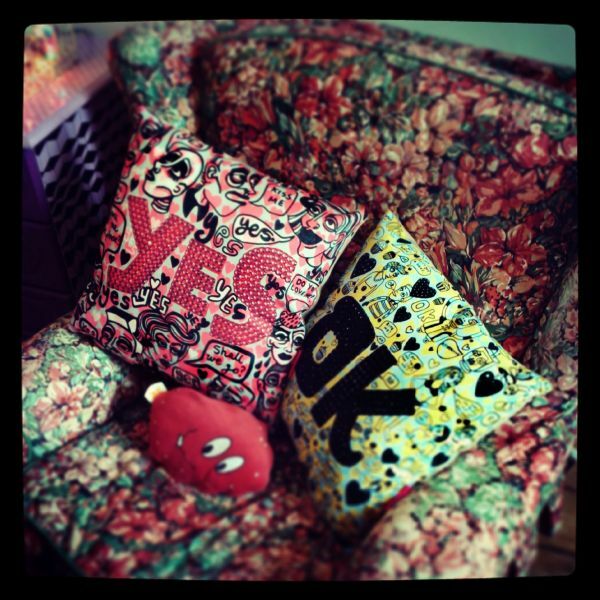 Thefty Cushions: Last Chance to Buy! Hello! 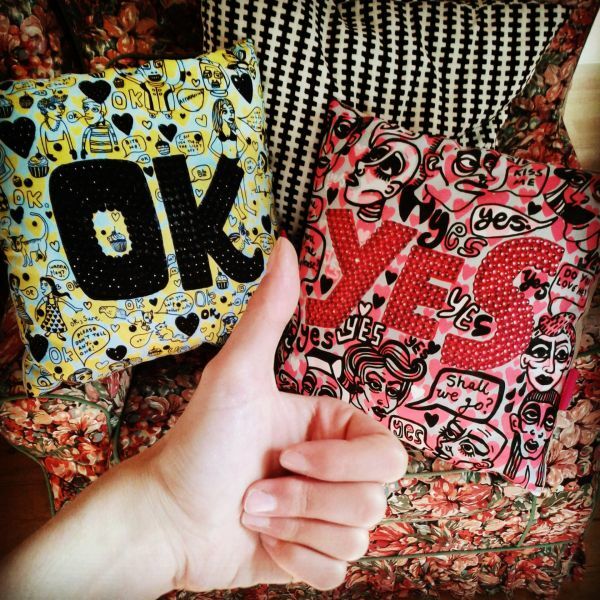 As you might already know, two of my cushion designs are for sale on Ohh Deer, as part of their Pillow Fight competition shop! I wanted to give you a heads up that the shop closes in one week (November 11th)! In other words, if you’d like a cushion or two, you’d better move very quickly! 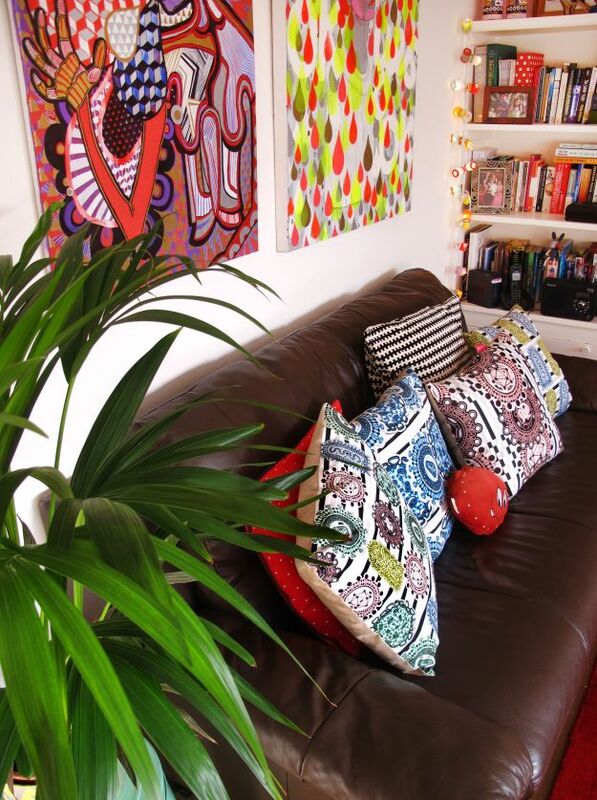 You can buy my cushions here and here. I bought a set of the cushions to check the quality, and I was really pleased -They’re soft, sturdy, and the colours are nice and rich! About the competition: The winners will become official contributors to the Ohh Deer collective, which is an amazing opportunity! The winners will be chosen based on how popular their cushions are, in terms of sales, but also in terms of how many shares they get on social media. 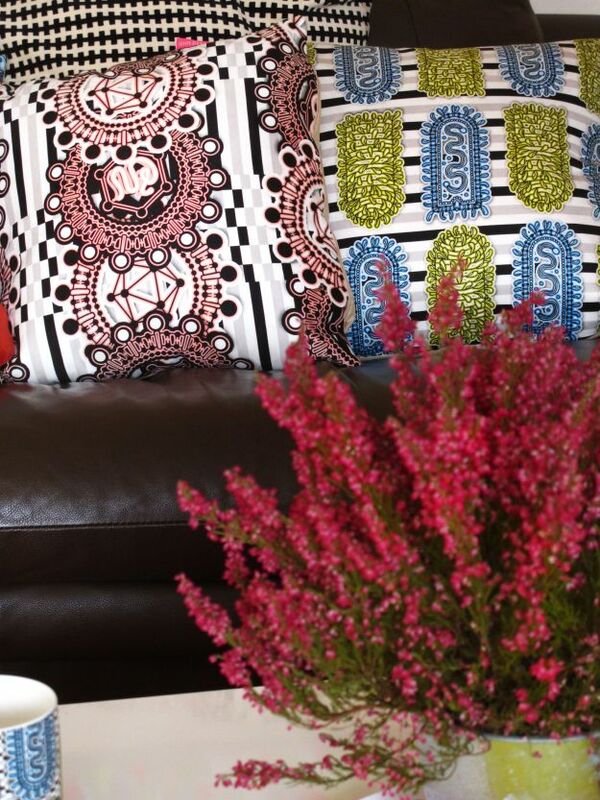 So, even if you can’t buy a cushion, please help me out by sharing them on Facebook, Pinterest and Twitter! I want to give a massive thumbs up to all of you who have supported my competition entries over the last month. Thank you so much! Pillow Fight! 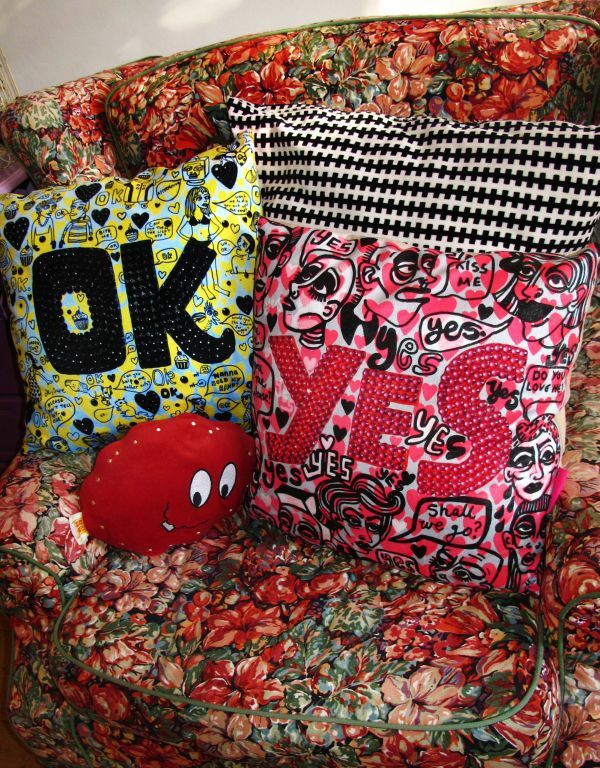 Thefty Cushions in Stock! Exciting news alert! 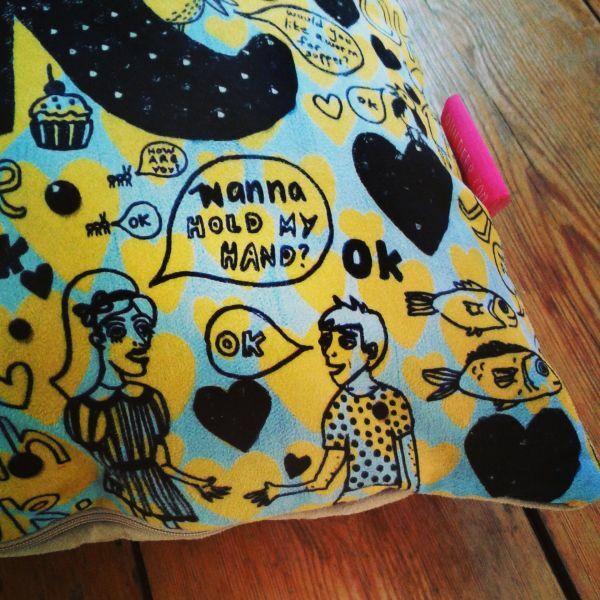 Two of my cushion designs are currently for sale on Ohh Deer, as part of their Pillow Fight competition shop! The cushions will be available for one month only. The shop closes (for good) on November 11th. You can see and buy my designs here and here. 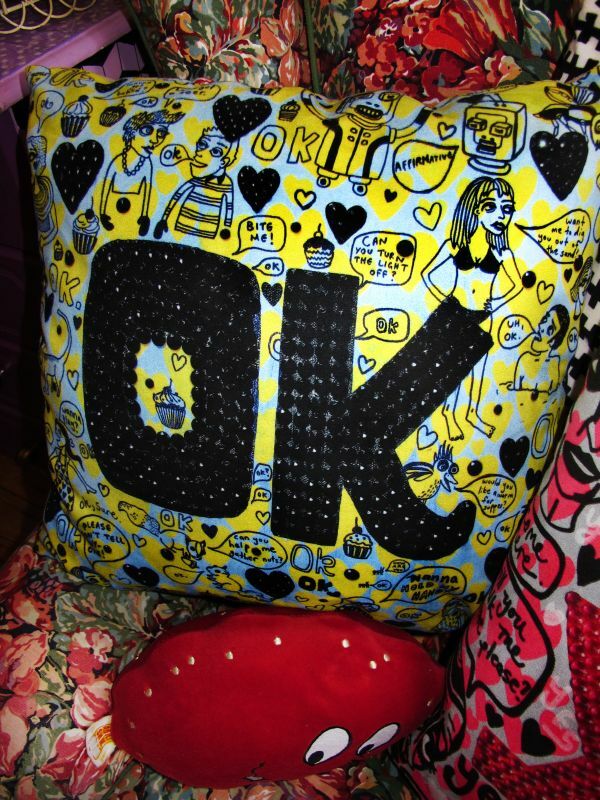 Click HERE to buy my ‘OK’ pillow! 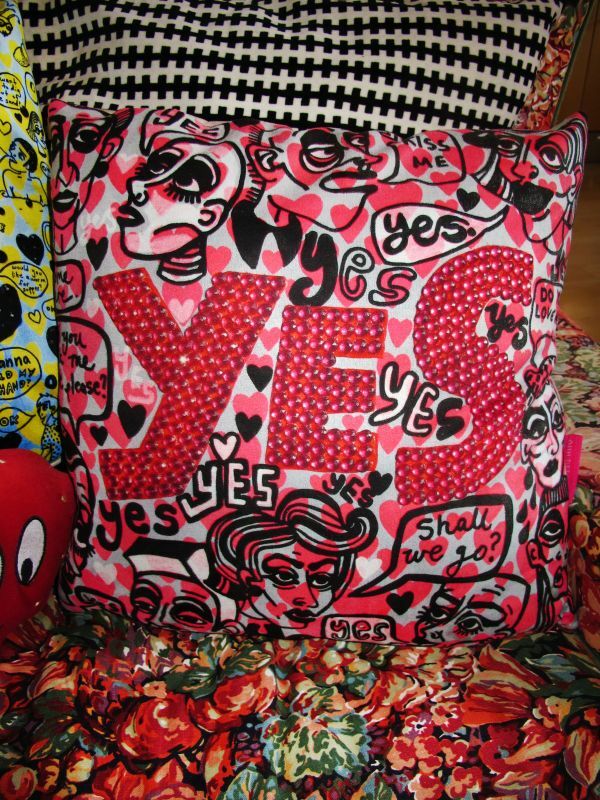 Click HERE to buy my ‘YES’ pillow! It is so exciting to see my designs in the Ohh Deer shop!